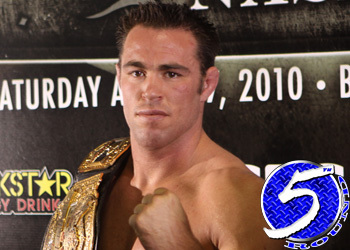 To the surprise of few, Strikeforce middleweight king Jake Shields will no longer be competing for the San Jose, CA based organization. However, it wasn’t known until Wednesday night how the free agency frenzy would conclude. Strikeforce CEO Scott Coker confirmed with Sherdog.com the company has waived the final 2-3 week exclusive matching period they were allotted and have opted to release the controversial wrestler outright. Although Coker would not elaborate on their newly vacant 185-pound throne, it’s rumored the company has already been working on a middleweight grand prix tournament to fill the vacancy. Jack Shields, the fighter’s manager and father, told the website Strikeforce wasn’t stoked over their extended flirtation with the Octagon. “In the conversation we had today, [Strikeforce] said they felt that Jake was leaning towards the UFC. Honestly, we were talking to them with an open mind, though Jake wants to fight the best,” said Poppa Shields. “Between Strikeforce and EliteXC, Jake had the chance to fight on Showtime and CBS four or five times against some top fighters like Dan Henderson and Robbie Lawler. Shields technically hit the open market after dominating Henderson in April at “Strikeforce: Nashville.” He’s been shopping his services across the globe, however the UFC served as the clear front-runner because they house the planet’s top dogs. According to the report, Shields submitted figures to Octagon brass earlier today for a series of bouts against top contenders in the UFC’s welterweight and middleweight divisions. “We didn’t come to an agreement with Strikeforce, but Jake’s excited to challenge himself against the likes of Anderson Silva and others in the UFC,” said Sr. Shields. According to Daddy, his boy would prefer to challenge for the 185-pound belt first because welterweight champion Georges St-Pierre is currently occupied with “The Ultimate Fighter 11” and an impending scrap with his coaching rival on the reality show, Josh Koscheck. The 31-year-old holds a 25-4-1 pro mark and has rolled off 14 straight wins.